Mark Papa, the CEO of Centennial Resource Development Corp (CDEV) is known as the “Godfather” of shale oil. Following the recent release of its Q4 2018 earnings report the share price of the Godfather’s company was taken out to the woodshed. The company missed analyst expectations… BIG time… and the stock immediately dropped 25%. OUCH. But in his Q4 earnings call with analysts, the “Godfather” certainly wasn’t apologising to anyone. Instead Papa pointed his finger in the other direction – at the analysts whom he says were incompetent in building their estimates. Papa doesn’t seem to care about not measuring up to analyst expectations. I wonder if his shareholders who have seen the share price more than cut in half have a different view? Much worse for Papa and his shareholder however…. I Tried To Warn You That These Kids Were Going To Be Troublemakers! The hot button topic that caused analysts to overestimate what Permian producers like CDEV are capable of is parent – child wells. In the horizontal oil and gas business, the first well that is drilled on a piece of land or location is considered a parent well. These wells are drilled into the best location and have the entire oil or gas reservoir all to themselves. The drilling that comes later that drills up the rest of the field, called infill drilling, is referred to as the child wells. As you would expect, the parent wells are more profitable than the child wells. Child wells often have less pressure from the reservoir and sometimes “communicate”, or overlap their drainage areas with the parent wells. And all that means this: the best Permian wells have already been drilled for many (most?) oil producers. Producers across the Permian are finishing up with the parents and moving onto the children. 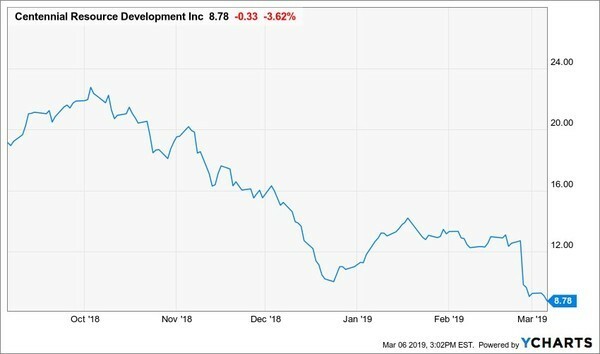 I first warned about this looming problem last September and it has now clearly come back to bite CDEV shareholders and all Permian operators. The chart below is from a study (SPE 194310) completed by Schlumberger. The chart adjusts Midland Basin wells for lateral length and pounds of sand per foot to make them comparable by year. 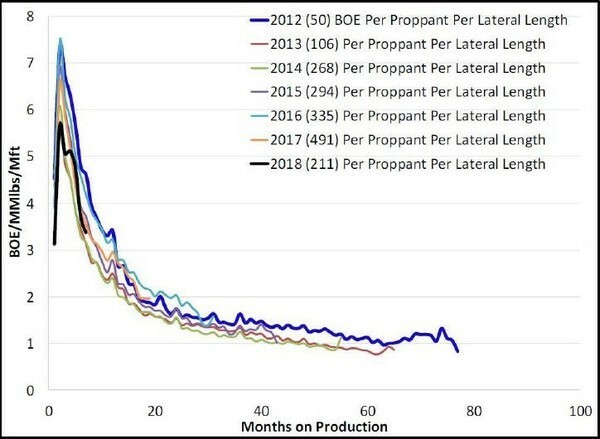 This is an “apples vs apples” view of how Permian wells perform by year they are drilled. What the study shows is that while IP rates have gone up significantly over the past seven years as the wells got longer and amount of sand used increased… the older wells produce more oil, for less money. The Permian wells aren’t getting better every year… they are actually getting worse. Wall Street analysts have not been factoring in the impact of producers like CDEV moving to drilling child wells. That is why the analyst expectations for CDEV were far too high for Q4 and why the company was unable to meet them. For shareholders of a company like CDEV – which has gone from $20 at the start of 2017 to under $9 today – the idea that the best wells have now been drilled can’t be terribly comforting. Papa has been open about this parent-child well issue for a while now. His take on the issue is – this is the reason that Permian production growth is going to hit the brakes hard. He has gone as far as to say that rapidly slowing Permian production growth is going to leave the world facing an oil supply shortfall, and lift oil prices. His message is that independent producer like CDEV are going to thrive because oil prices are going up as Permian production growth halts. The parent-child well issue got a lot of attention following CDEV’s share price shellacking. I think the parent-child well issue is a tempest in a tea-pot. The real Permian parent – child issue is not about wells now. The bigger parent-child issue in the Permian is actually about the majors (parents) versus the independents (children). What it boils down to is that the parents have arrived on the scene and the children are about to get spanked. The talking point for months from Papa has been that the parent-child well issue is going to slow Permian production and do great things for the price of WTI. The plans that Chevron (CVX) and Exxon (XOM) just rolled out this week tell a very different story. These two companies alone will assure that Permian production growth is slowing down no time soon. Not for years to come. Chevron and Exxon are playing a different game than the independents. The majors don’t need to worry about where the cash is going to come from to drill. They don’t even care what the price of oil is. Within a couple of hours of each other on Tuesday of this week these two energy behemoths revealed their plan for the Permian. Combined we can expect just these two companies to be producing almost 2 million barrels per day out of the Permian. Chevron is planning for 900,000 barrels per day by 2023 and Exxon is looking to hit 1 million barrels per day by 2024. The slide below is from Exxon’s March 6, 2019 investor day presentation. The intended production ramp up isn’t subtle. One year ago Exxon was planning to take combined Permian and Bakken presentation to 650,000 boe/day by the end of 2025. Now that number is 1.3 million boe/day by 2025 with almost all of the growth coming from the Permian. Exxon just told us that the company has doubled its shale growth intentions – and we are supposed to believe Papa’s view that Permian production growth is going to grind to a halt? 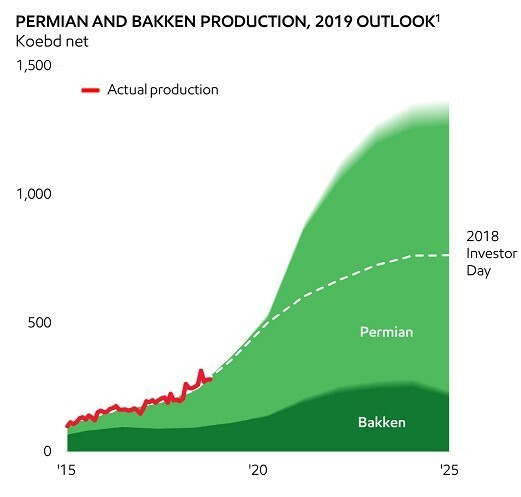 NOT A CHANCE… the scale of what is about to happen with just these two majors will override all Papa’s Permian production concerns for a few years. It makes it hard to be bullish on WTI pricing (even with all the increased US export capacity). Chevron’s most recent presentation looks exactly the same. It shows Permian growth going from very little today and heading straight up. 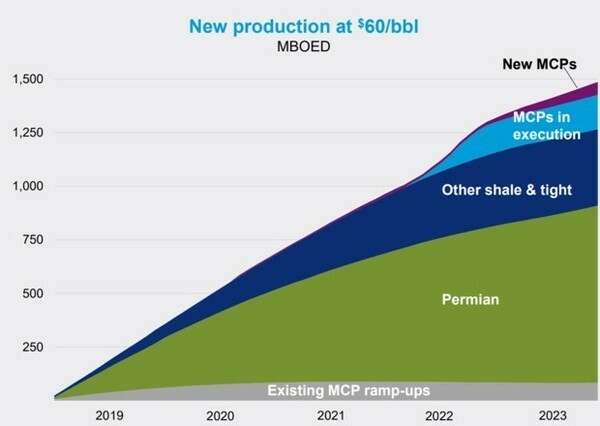 The new Chevron Permian target of 900,000 boe/day by 2024 is a 40 percent increase from the company’s stated intentions from a year ago. Together Exxon and Chevron alone are going to grow their Permian production by close to 1.5 million boe/day within 5 years. The entire Permian current produces roughly 4 million boe/day. Welcome to the big boy game… it is the long-established way that the oil patch works. Wildcatters and small explorers take the risks and prove up a play, then the majors move in and take over from there. The independents rushed into the Permian and moved quickly to drive production up fast. The majors meanwhile sat back and took their time to study what was going on not with a focus on fast… but on doing things well. There is no silver lining here for Papa, CDEV or the other Permian independents. They haven’t generated any wealth for shareholders as of today and the road gets much hard from here. I see the silver lining is in the Midstreamers – the companies who get paid to move all that oil and gas from well to refinery. After doing A LOT of research, I’ve bought what I think is the best stock to profit from all this increased Permian production. Previous post: More Wind Power Means…Surprise! More NatGas Use!